All Central Govt. 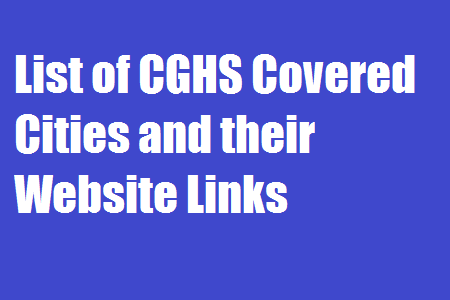 employees drawing their salary from Central Civil Estimates and their dependant family members residing in CGHS covered areas. Central Govt. Pensioners/family pensioners receiving pension from central civil estimates and their eligible dependent family members. OPD Treatment including issue of medicines. Specialist Consultation at Polyclinic/Govt. Hospitals. Indoor Treatment at Government and Empanelled Hospitals. Investigations at Government and Empanelled Diagnostic centers. Cashless facility available for treatment in empanelled hospitals and diagnostic centers for Pensioners and other identified beneficiaries. Reimbursement of expenses for treatment availed in Govt. /Private Hospitals under emergency. Reimbursement of expenses incurred for purchase of hearing aids, artificial limbs, appliances etc. as specified. Family Welfare, Maternity and Child Health Services.